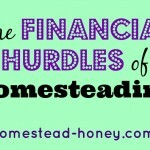 A few months ago, a reader wrote: How did you overcome the financial hurdles of homesteading, both starting and continuing? I am wondering if you homestead full time or if you or your husband work part time (or full time) in town. Obviously you are happily “living on less,” but you also have obvious real expenses. I loved this question. It’s probably something that many, many readers want to ask, but feel that it might be too intrusive. 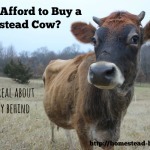 Two months ago I wrote about the Financial Hurdles of Homesteading, where I talked about the very real expenses that exist when you buy land, build a house, and create infrastructure for livestock, plants, and people. In the future I plan to also address how we “live on less.” In this post, I want to talk about what I call Creative Employment. I have always been one of those people who likes to change up her job every few years. I have so many diverse interests and skills, and I like learning new things. My undergraduate degree is in Biology, and for many years I taught at marine science centers, working with children and college students. When I moved to Oregon (inland), I found a job working at a wholesale plant nursery and an organic garden, and fell into my love of plants. I also took up dance after a decade hiatus, got very involved in the local musical theater scene, performing in and choreographing musicals, and ultimately decided to earn my Master’s degree in Arts Administration and Nonprofit Management. I’ve also worked with International Students, managed a theater box office, a children’s dance program, and a musical theater camp, and knit hats and painted silk scarves to sell at a craft market. So far in Missouri I’ve acted professionally, taught choreography to kids, managed a school garden, done transcription work, and cleaned houses. And I’ve just started a Sponsorship program on my blog that will help support my family as I support small businesses. My husband, on the other hand, has worked as a carpenter/handyman and self-employed Artist Blacksmith for the past 14 years. His creativity is expressed through working with wood, metal and other media as he creates and builds. One thing we have in common: We have rarely had a “real” job. One thing we also have in common: We have never earned “real” wages. One more thing we have in common: We have (almost without exception) really enjoyed our work. I guess my point here is not that you should work less or work more or quit your job to homestead full-time. It’s just that I truly believe that when it comes to balancing homesteading and employment, anything is possible. What are your passions? What are your skills? What can you make money doing? Put these together and see how you can create a life that you love. If you love working a 9-5 job, great! If you prefer to work part-time and garden the remaining hours, wonderful! Do you have techie skills like html coding? See if you can work from home and set your own hours. Do you love to create with your hands and sell your wares? Then see what options there are for crafters in your community, or join an online sales arena like etsy.com. If you want to homestead, or just spend more time connecting with the earth and with your community, then brainstorm ways that you can make employment work with your dreams. Our family supports our homesteading lifestyle with each adult working part-time to pay the bills, consciously cutting expenses, and remaining open to ways to barter, trade, or do it ourselves. We try hard to find employment that feeds our souls, so we can in turn nurture our family and our community. This is a big topic, and there is so much more to say. 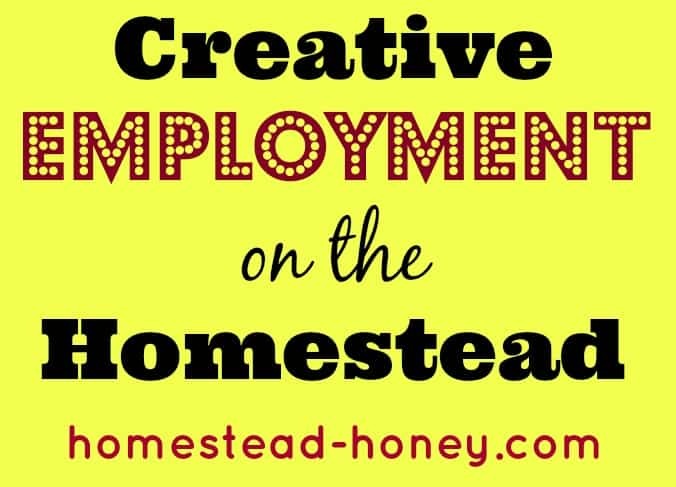 I hope we can begin a dialogue here in the comments, or on the Homestead Honey Facebook page, and support each other in finding creative ways to balance employment and homesteading. Great post, Teri! You’re really ‘hitting your stride’ with what to talk about here. I love seeing how much you’re doing. And look at all those great sponsors! Excited…. Thanks Lisa! You’re a big support. Love this post (and your blog). This post really hit home as I too have never had a “real” except for a three year period in an office. I am much happier working part time at various jobs and spending the rest of the time in my garden! I never earned a masters but otherwise my life has paralleled yours! I like that it keeps life interesting! I LOVE this, Teri. I have really been wrestling with the feeling of not being able to afford to quit my job, but not being able to have fun and make money with the things I love because of all the time I spend at my job. Something that I often forget about in the equation of leaving my full time gig is the idea of community-based barter and trade. It doesn’t necessarily take dollars to have seeds to plant, skill shares at my land, etc. Often people ask me how I can work part time and my answer is usually that I just try not to spend money. Now that does not always happen, but I have successfully managed to keep rent very cheap my entire life, partly by chance and partly by intention, and that helps a lot. Growing food and buying bulk helps a lot. Having an older car, etc. So by taking some expenses out (barter being another way) I can take out some work time. Have to be fully honest though and say that my saving’s account is not necessarily robust right now. So i am still refining. Great thoughts. I had no idea you had done such a wide variety of things! We’re still figuring this out. 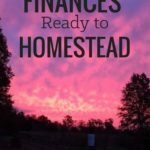 Right now I run the homestead while my husband works full/part time – from home/on the road. It isn’t the ideal situation but it is what works for us at the moment. It has taken us years to figure out a good balance, but us both working part-time seems to be the best solution for our family. This is a great post – people want to know but don’t want to intrude on people’s privacy by asking. Thanks Angela! I do think that money is one of those topics that needs to be de-mystified! Yes, happiness is always what I’m going for! Great post. We’ve been blessed with flexible employment and an entrepreneurial spirit. And neither of us have settled for conventional jobs. One unexpected blessing has been the gift of our own generosity. We’ve given to those who are in a place we ourselves have been. And we’ve been blessed with returns. I don’t know how it works exactly. There sure doesn’t seem to be a formula but living in abundance rather than in scarcity sure seems to help! thank you so much for sharing this. We are starting to feel like we are able to be on the giving end of the cycle, after so much receiving this summer. I think it is important to note that not everyone will be able to drop out of the “normal” work-a-day world and get along in remote locations on their own. It takes strength of character that can be flexible, improvise in extreme circumstances and remain secure and happy despite major setbacks. A support network or at least contact with some community is also necessary; no man is an island and when you are hanging from a tree in the wilderness you really come to appreciate the support you took for granted to begin with. In the early 1990s I set out with meager savings from a short career to see how long I could “do without”, live the Mother Earth lifestyle and still enjoy myself. No matter where I went I found work and often times more work than I wanted even if the compensation was less than desirable. One main thing is to break the habits of consumerism; stay away from temptations that can ruin a meager budget and indulge only in the things you find for free. In this society of bloated economic expectation and wasteful practices, there are tons of opportunities to find what one needs for cheap or free if you develop your creativity and tune down your ego. In the 20 years after leaving my secure salaried position, I have not had a “normal” job, not collected a regular paycheck but have had some of the best experiences of my life in places and with people I never would have met otherwise (Teri and family included); I would not trade the experience for money. This is a wealth you cannot buy with a 9 to 5 job, the hours are much longer! Good point Ed, and we probably would have never moved here to NEMO had we not had a community of friends already established here. That was a really important piece for us – that we had support. As for breaking the habits of consumerism, that remains a challenge for me! i have to not go into the fun, cute stores that I really like! Thank you! I’m so glad that you read and take the time to comment as well! Some day I’d love to do a more detailed post about finances. It’s a really tricky thing. 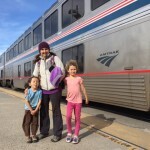 We were lucky in that we came into this new homestead with some starter funds, but our income is very, very small, so it means either dipping into savings, or just doing without. I would also be sure to write about the fact that we have absolutely no retirement assets aside from this land, so our life, while very rich in meaning, is very poor in what most people would consider to be assets. But We’re happy and healthy! 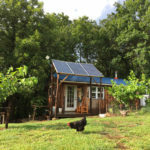 My husband and I are homesteading a tiny home on 20 acres in the Pacific Northwest right now and I am absolutely THRILLED that I just stumbled onto your site! I am going to be reading your blog all day! I especially love this article and I am a true believer that people nowadays work and spend WAY too much. We’re in the beginning stages of construction and your information will be so helpful. We are fortunate that our land already has utilities (well, septic, electricity) but eventually we would like to go full time to solar. It looks like you’ve got it figured out and I can’t wait to see all your successes and learn from you. It’s so nice there are people like you that are living the way we’re intended to live. I’m so excited to get our home built and live off the land and live to be happy, not to work for someone else. I wish you all the best. I’m so glad you found me! We moved here from Oregon, and love the NW so much. I can imagine that building and getting established is so much easier with utilities in place! Enjoy reading and keep me posted on how it goes!